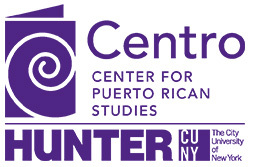 The Puerto Rico Research Hub of the University of Central Florida and the Center for Puerto Rican Studies at Hunter College-CUNY cordially invite you to participate in the Puerto Rico, Puerto Ricans “In Pursuit of Puerto Rican Studies” Research Summit to be held April 17, 2019 at the University of Central Florida Fairwinds Alumni Center in Orlando, Florida. The In Pursuit of Puerto Rican Studies Research Summit looks to establish a strategic direction for research specifically for Puerto Ricans in Florida, and more generally for Puerto Rican Studies as a field. The goals are to mobilize Puerto Rican researchers around an agenda that sets priorities from a Puerto Rican community perspective and is relevant to a broad range of stakeholders; and advance the implementation of a vision of promoting the understanding of the post Hurricane Maria social conditions of stateside Puerto Ricans and affecting positive social change among the processes and institutions that affect the welfare of our community. April 17, 2019, 8:00 a.m.-5:30 p.m.
*Parking for attendees is available in Garage H or Garage D for a fee. *Parking: The HUB has negotiated a reduced parking permit rate of $3.00. The first 100 conference attendees can receive the rate by providing the following event code is ASP813. Parking permits are only valid in student parking lots and garages. These lots are marked with green signs that include the letter (D), which denotes a student permit. Parking in any Faculty (B), Staff (C), and specialty spaces are prohibited. At the link below, you will find a campus map that will help you locate the parking garage, HUB and alumni center. Anyone needing hotel accommodations, please refer to the list of local hotels here: https://www.ce.ucf.edu/Hotels Most of these hotels provide a UCF discount. 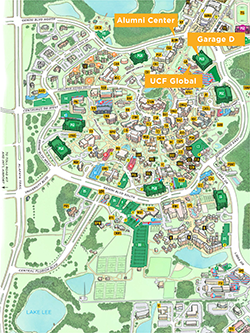 Please mention that you are attending a UCF program when contacting the hotel for any specials they may be offering.